Vigo, March the 5th, 2013. The shipyard Metalships & Docks celebrated the delivery and naming ceremony of its latest new built, the DEEP ORIENT, an Offshore Construction Vessel / ROV of the successful 100-Series design, which will support TECHNIP’s subsea jobs in the Far East. This vessel is a confirmation of the shipyard’s strong internationalization, firmly positioning it as a world reference in the construction of highly sophisticated tonnage. Various local and regional government officials attended the ceremony, such as, the President of the Government of Galicia, Alberto Núñez Feijóo; the Mayor of Vigo, Abel Caballero; The delegate for the Government of Spain, Samuel Juárez, and the Minister of Economy and Industry of the Government of Galicia, Francisco Conde. Top executives and managers of the owning company, TECHNIP, also attended the ceremony as well as representatives of the main supplying firms which contributed to the building of this vessel. During his speech, the President of METALSHIPS, Manuel Rodríguez, pointed out that the DEEP ORIENT symbolized a new achievement for the Shipyard which has been building vessels which operate all over the world, for years. 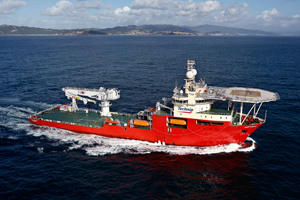 The Executive Vice-President and COO Subsea of TECHNIP, Frédéric Delormel, also pointed out in his speech, that they were anxious to incorporate the DEEP ORIENT into their fleet, as the high quality of this new vessel will add new capacities to the services that TECHNIP offers to its customers all around the world. DEEP ORIENT will be based in Le Trait, France, and will do its maiden job in the Norwegian North Sea for a period of 3 months. Afterwards, it will operate in Asia. The close cooperation between TECHNIP team in Aberdeen (United Kingdom) and METALSHPS during the building of the vessel gave outstanding results in the reduction of the number of accidents. It also assured the timely delivery of a complex vessel and to the full satisfaction of her Owners.. The Godmother of the Deep Orient, Veronique Delormel, pointed out before crashing the bottle against the vessels bow, that it was an honor for her not only for being the Godmother of this vessel but also for “being in this great city of Galicia, a region which is a doorway to the Atlantic Ocean and also a land of legends. And as Galician, I am convinced that this fantastic vessel has everything it needs to become a very decent portrait in the petrol and gas industries”. DEEP ORIENT belongs to the named 100-Series Project of which Metalships has already delivered six units, with one more under construction for JRM (Houston). The vessel delivered today has 135 meters of overall length and a 27 meter beam, DP-2, 5 propellers (3 azimuth propellers y 2 transversal propellers), a large crane with a 250 Tons capacity, two launch and recovery systems (LARS), two Rovs (Remotely Operated Vehicles) and a crew of 120 people, being able to reach a speed of 15 knots. It is SPS compliant and has been provided with state-of-the-art environmental equipment, fulfilling all enforce regulations. This is the second vessel that Metalships has built for TECHNIP, leader in engineering and building projects for the energy industry, with a work force of 32.000 people and present in 48 countries.